Whether you're a teacher in the midst of planning a Thanksgiving-themed yoga class, or a practitioner looking to add a little seasonal spice to your Turkey (or Tofurkey) Day practice, we hope you'll find some inspiration from the holiday-inspired pose variations below. The following suggestions are meant to be included as part of a well-balanced practice, and not as an independent sequence. Include a a few of your favorite “bird poses” in your sequence. Sure, “Thanksgiving birds” might seem a little silly. But as far as we're concerned, there's nothing wrong with a little celebratory silliness when it comes to a holiday-themed yoga practice! We especially like mayurasana (peacock pose) which (Thanksgiving-related bonus!) is often said to stimulate digestion. And a bow of gratitude. Forward folds are sometimes described as having a “devotional” quality. After all, you are, quite literally, bowing forward in these shapes. And anjali mudra (offering gesture, sometimes referred to as “prayer position”) often evokes a similar sense of reverence. You can combine them both with a pose such as child's pose with hands in prayer, or parshvottanasana (intense side stretch, or “pyramid pose”) with reverse prayer hands, pictured above. If you prefer, keep your front knee bent and/or come down only halfway (with a long spine) in lieu of folding forward. Many yoga teachers refer to backbends as “heart openers,” making them an especially lovely addition to a gratitude-themed practice. 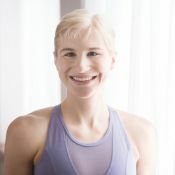 As with the backbendy pigeon described above, you might consider bringing a hand to your heart in poses like natarajasana (dancer pose), ustrasana (camel pose), chamatkarasana (“wild thing”), or even your urdhva dhanurasana (upward bow pose, pictured above) if you're feeling especially stable and strong in the pose. Restful, restorative asanas can be nice to include in any holiday practice (they're a fabulous way to wind down, de-stress, and recharge). And while we definitely wouldn't recommend any post-pumpkin pie mayurasanas or urdhvas, you may find that some of the gentle, restful options below are nice to practice at the end of the day. Sit between your feet in virasana (hero's pose). Sit on a block or folded blanket if your seat doesn't comfortably touch the floor. Lie back over a bolster, adjusting as needed until you feel nice and comfy! Keep your arms alongside you or bring one (or both) hands to rest on your belly. Sit tall a couple of inches in front of a bolster. (We like to elevate the far end of the bolster with blocks for a slightly gentler variation.) 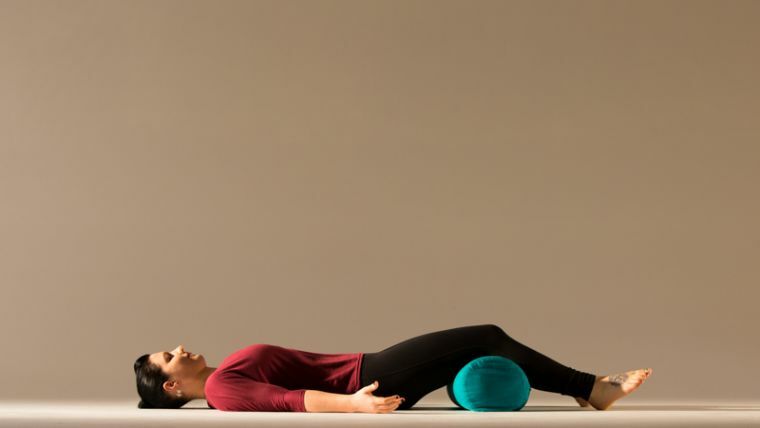 Bring the soles of your feet together in baddha konasana (bound angle), and then lie back over the bolster, adjusting your seat toward or away from it as needed for comfort. Keep your arms extended alongside you, or place a hand on your heart. You might also consider placing one hand on your heart and one on your belly as you rest and breathe here. We would no more want to skip shavasana than we would our favorite Thanksgiving pies (and we are definitely not skipping those!). Think of shavasana as the “dessert” to your Thanksgiving practice. And it is a holiday, after all, so feel free to get really decadent, incorporating as many of your favorite props as you like. Once you get settled in, ask yourself: Is there anything I could do to make this shavasana even a little bit more comfortable? And if there is, do it! It may mean placing a bolster under your knees, a pillow or folded blanket under your head and neck, a warm cozy blanket over your body, or just moving a stray prop out of the way. Do whatever you need to get cozy. Then lie back, and enjoy!